In the present chapter, we map and characterize crowdsourcing and crowdfunding platforms that promote social entrepreneurship in the online universe. We first analyze relevant theoretical concepts and the existing literature on entrepreneurship, digital inclusion, information and open culture, digital culture, and social technologies to better understand the genesis and development of initiatives that promote social entrepreneurship in the online universe. Then, we map and describe the platforms that tried to encourage this type of entrepreneurship around the world, especially in Brazil. 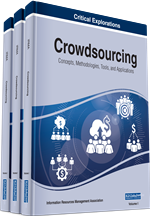 Finally, we examine some important aspects of the panorama of crowdfunding in Brazil. By exploring the current development of crowdfunding and crowdsourcing platforms at international level, we expect to contribute to the creation of new projects and policies that respond to the current demands of the network society. The use of information communication technologies (ICTs) around the world has increased dramatically over the past 20 years. ICTs affect all aspects of everyday life. They allow users to access, store, transmit, manipulate, produce, and publish information, thus providing a wide array of opportunities for education, professional development, and lifelong learning. According to Cardoso (in Passarelli & Azevedo, 2010), the world is not only going through financial, political, and environmental crises but also through a communication crisis. This phenomenon, as Cardoso (2010) explains, can be seen in a series of events and habit changes. It can be seen at the sharp fall in newspaper sales; the proliferation of P2P audiovisual content distribution; the increase in Internet advertising; the role of social networks in the daily coverage of events; the Open Access, Open Source, and Open Science models; or the case of media production destined to online sharing. The communication crisis transforms, or at least questions, all dimensions of information production, distribution, and consumption. It also affects the way we approach entertainment and knowledge. As Cardoso points out, we moved from a system of schemes and matrices of mass-communication based media to a model based on networked communication. This new model coincides with the emergence of a new set of skills, attitudes, and behaviors that are necessary to participate in today’s network society. Passarelli (2007) explains in Interfaces digitais na educação: @lucinações consentidas (Digital interfaces in education: consensual hallucination), the globalized world is typified by intense capital, product and information flows and has started to require new competencies from its citizens. These competencies are what we call today “emerging digital literacies” (2007, pp. 40). Digital literacies are a new set of habits, attitudes, and behaviors that are necessary for full participation in today’s media-saturated society. They affect the way people learn, work, socialize, and use their free time. They also increase their access to education, employment, entertainment, and health. Their development constitutes a necessary step to adapt to the fast-changing world of information and communications technology. In 1997, Gilster (1997) coined the term “digital literacy.” According to Gilster, digital literacy is a “logical extension of literacy itself, just as hypertext is an extension of the traditional reading experience” (pp. 230). The author defines digital literacy as “the ability to understand and use information in multiple formats from a wide range of sources when it is presented via computers” (pp. 1), and he sheds new light on the concept by stating that “digital literacy is equally about context” (pp.35). Warschauer (2003) later developed a concept of literacy to address the various social, economic, human and digital resources that affect the “effective use of ICTs to access, adapt, and create knowledge” (pp. 47). Jones-Kavalier and Flanningan (2008) argued that literacy is characterized by the ability to use information effectively and creatively. Finally, Jenkins (2008) discussed the emergence of a media convergence culture, characterized by nonlinearity and interactivity. In recent years, the development of ICTs and the emergence of new digital literacies have opened up opportunities that used to be restricted to a very privileged sector of society. In fact, ICTs have favored the genesis of an online social entrepreneurship phenomenon that has led to the creation of online platforms that attempt to develop a taste for entrepreneurship in its users. These platforms help people to identify opportunities that can be transformed into projects to promote community development. The objective of this type of platforms is simple but challenging: to make entrepreneurship accessible to everyone. The initiative “Social Good Brasil” is a notable example of this recent trend.